Ask A Walmart Expert: From How Many Miles Away Will Walmart Ad Match a Store? From how many miles away will Walmart Ad Match a store? The only parameter that the Walmart policy gives us is that the store needs to be “local”. A safe bet is any store that you could drive to in less than an hour so 50-60 miles is usually a safe range. However, like most of these questions, it is ultimately up to the store manager. If you are unsure about whether or not your store will price match someone, ask the CSM on duty or the store manager. 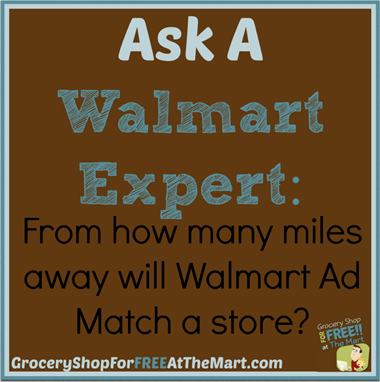 Click here to read more in our Ask a Walmart Expert series.